We serve the best ice cream, ice cream cakes, and baked goods for the best price in a family friendly environment. Don’t just have ice cream, have the whole ice cream experience! If you are in Maine, whether it’s York, York Beach, Cape Neddick, Kittery, or Ogunquit we have plenty of desserts for you! We carry over 20 premium ice cream flavors, frozen yogurt, sorbet, and sherbet. We have many delicious toppings for sundaes and banana splits. Our handmade waffle cones are made from scratch. Beverage options include healthy real fruit smoothies, old-fashioned soda floats and frappes (milkshakes), Italian ice, and several coffee drinks. Celebrate a special occasion with one of our delicious ice cream cakes or baked goods. And now we make our own homemade caramels! 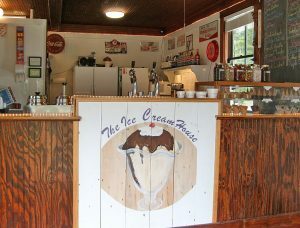 Don’t forget to check out Village Scoop Ice Cream in York Village! See What our Customers Think about our Ice Cream..